When I realize that I cared about you more than I cared about my friend. What I mean is I realize that my feelings going to wrong path. We used to be a best friends. We talked and we shared a lot of things. My journey, your journey, my thoughts, your thoughts and our souls I think. We became one, We blur to be one, and its called love. I have no idea I could gave you the damn thing that I can ever never gave to someone else. When the end of our road, you pull me out. Out of your life and it makes me not know about you anymore. You become someone else that you said you would never be. And it happens we screw up, I dont know it becomes to be the war of our ego or our love. 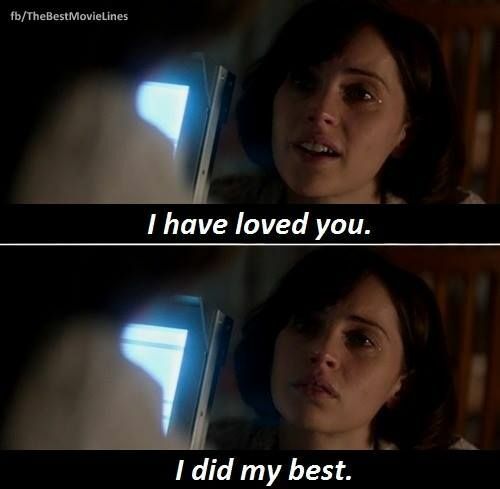 one thing that I want you to know, I have loved you, and I did my best. If your not realize it you will. One day you will realize it I believe it would happen. I still love you Capt, and I will. but Goodbye. This pic from The Theory of Everything Movie, at least I gave him my best.